Wetsuit division swimmer on Donner Lake. A new competition called the Reno-Donner Double has been created for swimmers and runners this summer. The Reno-Donner Double is swimming the Donner Lake Swim on August 16 and running the Reno 10 Miler run on August 17. The Donner Lake Swim is a 2.7 mile open water swim that starts on the east end of Donner Lake and ends on the west shore. Most competitors swim the icy water in a swimsuit, but wetsuits are allowed. A free post-race meal is provided at the finish line. The Reno 10 Miler is a 10 mile run through the streets of downtown Reno. The traffic free course passes through historic downtown, Idlewild Park, the UNR Campus, and along the Truckee River. There will be cash prizes for the top overall male and female divisions. Swimmers need to start a running program and runners need to start their swim lessons now in preparation for the Reno-Donner Double. 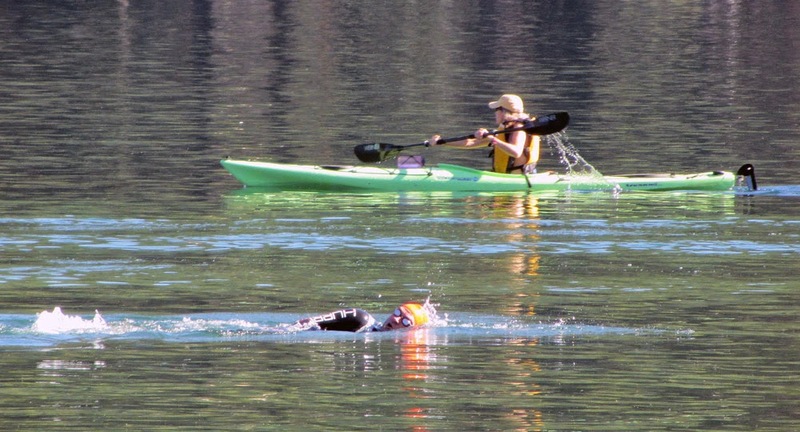 Registration for the Donner Lake Swim will open June 1. Registration for the Reno 10 Miler is open now. For the latest swim or Double information visit Donner Lake Swim on Facebook or email donnerlakeswim@gmail.com .